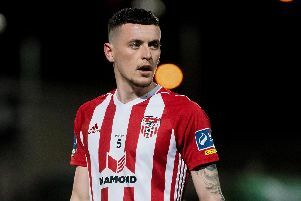 IF YOU stand still in modern football you’ll get left behind so it’s encouraging to know Derry City has been a trend-setter when it comes to the League of Ireland’s long overdue data revolution. And City boss, Declan Devine has a secret weapon at his disposal in the form of sports analyst, Seamus McCallion with the Brandywell club fully embracing the football analytic era which allows managers and staff to do their jobs much more efficiently. If it helps you do your job better, faster and smarter and it doesn’t burn a hole in your pocket then why not give it a go? The introduction of Russian sports performance analysis company, InStat to the League of Ireland was the brainchild of the FAI’s Head Performance Analyst, Ger Dunne who has been using it with the Republic of Ireland senior side for some time and now the league’s governing body have subsidised its use in the SSE Airtricity League. It’s been introduced for the betterment of the league and its already reaping its rewards according to Shantallow native, McCallion, owner of Premier Sports Analysis. The Candy Stripes were one of the first clubs in Ireland to introduce the system but now that all 10 Premier Division clubs are on board and using InStat this season, it’ll make the tool much more reliable and effective. A section of the InStat report on Friday night's Airtricity League clash between Derry City and Dundalk at Brandywell. The Foylesiders began dabbling in analytics almost five years ago when ex-boss and club legend, Peter Hutton contacted life-long City fan McCallion and the man behind the lens at Brandywell, video analyst, Brolly to get on board. Since then the advancements in technology have been incredible but McCallion explains Derry has been proactive in terms of using technology and stats in a bid to get ahead of the game. “The FAI have put a big emphasis on it this year,” explained McCallion. “It’s a massive part of the game. Derry has been the most proactive club in the League of Ireland I think it’s fair to say. Although it’s come into the league now we’ve been proactive with it for close to five years and are probably one of the most advanced club for analysis in this league. We do a lot of stuff that other clubs wouldn’t even know about at the minute. I first became aware of InStat following an interview with the former manager of Dinamo Minsk, Sergei Gurenko, ahead of Derry City’s UEFA Europa League first round qualifier last season. A section of the InStat report on Friday night's Airtricity League clash between Derry City and Dundalk at Brandywell with a focus on passing and possession. The former A.S. Roma midfielder has since been replaced by the Belarusian club but ahead of the first leg at Brandywell Stadium, Gurenko admitted he knew little about Derry and would use the company InStat to gather the necessary information ahead of the game. A quick Google search and I had no end of links to stories and information about how the company and lots more like it have revolutionised football. In fact Derry, under new boss, Devine, are actively seeking ways in which to improve the way they gather data without pulling too forcefully on the purse strings and they’re now keen to invest in an injury prevention system used by LA Galaxy and Man City. Derry City's video analyst, Seamus McCallion. In 2015 the FAI announced a ‘ground-breaking’ initial four year partnership with TRACKCHAMP - the ‘ultimate data tool to assist in the improvement of performance, on the pitch and in the boardroom’. Its many features include live-streaming, data collection and video analysis. According to McCallion, the current deal with InStat provides much more in-depth statistics which assist the management team when improving player development, scouting the opposition, medical assessments, injury prevention and how you can bring the best out of players both physically and mentally. So how does it work? InStat, which has an office in Limerick, gathers videos from clubs and upload the game footage usually on the night of the game, or at the very latest the following morning with the company guaranteeing a turnaround of 24 hours. The match report then gets sent out to both managers and the game is immediately available online and on the app. “The information all goes into the mainframe. It’s a cloud system and is accessed by all clubs. If you are playing teams in Europe, the downside to it now is that they will have a lot more information on us now. But it’s only going to enhance the league. There’s no end to the data it provides and it arms you with every possible stat you could want on both your own team’s performance and your opponent’s but it’s how that’s interpreted which is key and that’s where Derry are out in front. Cork City have Lisa Fallon, a full-time performance analyst while Ruaidhri Higgins was well adept in its use in his previous role at Dundalk last season. While the introduction of the system in a way makes it a level playing field for all, the top clubs have become experts in its use and are already looking at other ways to improve. Devine is one of the new ‘tech savvy’ generation of managers who are keen to adopt new methods and McCallion has been hugely impressed with how he’s embraced the use of sports analysis. The use of stats can only take you so far but there’s no doubting its become a huge part of the modern game. Derry appear to be more adept than others but more and more clubs are investing time and finances on the latest technology. Ballymena United are the leading light in the Irish League having followed in Derry's footsteps and it's only a matter of time before others in the north follow suit. If it can help improve the product and enhance Irish clubs’ prospects in European competition then it’s important to continue to invest and who knows where it can take us.